Obama threatened to use military force against Syria if it used chemical weapons, but then after more than 1,000 died in a chemical weapons attack, Obama found plenty of reasons not to. Rhodes cites German Chancellor Angela Merkel’s disapproval, a “hangover” from the Iraq war of 2003, and opposition in Congress as stopping him. Rhodes, a who started his career attempting to become a novelist before flocking to Obama’s campaign, gave an insider’s account of the historic decision the president made not to enforce his own threat when chemical warfare broke out in Syria. A year later, Syrian President Bashar Assad’s regime had done just that. A sarin gas attack killed more than 1,000 people outside Damascus. The dead included women and children. Chemical weapons like sarin gas are designed to seep into shelters, making them incredibly efficient at killing civilians, who bore the brunt of Assad’s attack. But Obama’s “red line” was never enforced. According to Rhodes, Obama wanted to follow through, but found plenty of reasons not to and eventually struck a deal with Russia to remove Assad’s chemical weapons. In an excerpt from his new book “The World As It Is” posted on The Atlantic, Rhodes details what happened behind the scenes after the sarin attack that called Obama’s bluff. According to Rhodes, Obama did not strike Syria for a mixture of the following reasons: A “hangover from the Iraq War” that caused the whole of the US government establishment to dread the thought of another war in the Middle East; congressional approval for the strike seemed unlikely; and German Chancellor Angela Merkel cautioned against it. Rhodes described Republican members of Congress as simultaneously bashing Obama’s response to Syria as weak and refusing to grant him the authority to strike. However, two years earlier, Obama had ordered the US Navy to strike Libya without congressional approval. Still unsure over whether or not to strike after Merkel suggested taking action at the United Nations and trying to gain support from European allies, Obama had a “big idea,” according to Rhodes. 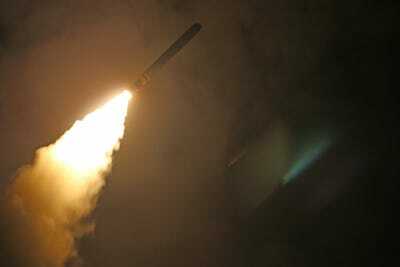 Obama would seek congressional approval for the strike, even knowing he was unlikely to get it. But while pushing Congress to approve a strike and make good on a presidential red line gave every appearance of operating above board, Rhodes admits that Obama only did so while maintaining he had the right to strike Syria even if Congress voted against it. Rhodes wrote candidly on the Obama administration’s wish to cash in on “the public dynamic” in the wake of the horrible images of the gas attack coming out of Syria. But a meeting between Obama and Russian President Vladimir Putin at the G20 summit gave them an out before they ever had to mobilize public opinion toward a war with Syria. US Navy photo by Mass Communication Specialist 3rd Class Kallysta CastilloThe guided-missile destroyer USS Laboon (DDG 58) fires a Tomahawk land attack missile April 14. The Syrian civil war continues to this day with no end in sight. A staggering number of dead and displaced Syrians underline the failure of the US and international community to decrease protracted and blatant suffering. But under Trump, the US has struck Syria twice for chemical weapons use, and didn’t ask for congressional approval in either instance. While Rhodes paints a picture of a US ready for a massive military campaign against Syria that he often compares to Iraq in 2003, Trump simply hit a few targets in punitive strikes which went virtually unpunished.